It is the breakthrough that physicists and chemists around the world have long anticipated and it will play a pivotal role in information technology in coming years. Researchers at Johannes Gutenberg University Mainz (JGU) have managed, for the first time, to directly observe the 100 percent spin polarization of a Heusler compound. Heusler alloys are composed of several metallic elements arranged in a lattice structure. They are among those materials that potentially can be used for ever smaller data storage components with ever greater storage capacity. However, doubts have been recently expressed as to whether Heusler materials are actually suitable for this purpose. The physicists at Mainz University have now demonstrated that the Heusler compound Co2MnSi has the necessary electronic properties. The project was conducted in collaboration with theoretical physicists and chemists at the Ludwig-Maximilians-Universität (LMU) München and the Max Planck Institute for Chemical Physics of Solids (MPI-CPfS) in Dresden. The results have recently been published in the online scientific journal Nature Communications. The findings provide the cornerstone for the future development of high-performance spintronic devices using Heusler materials. The potential applications include hard disk reader heads and non-volatile storage elements. Electrons act as charge carriers in metals and semi-conductors. However, they not only have a charge that is relevant in conventional electronics but also a magnetic moment, the spin, which can be thought of as originating from a rotation of the electron around its own axis. Spin-based electronics, or spintronics, is widely seen as an integral part of information technology of the future, but innovative materials are required if this concept is to be appropriately realized. Potential applications are, for example, hard disk drive read heads and non-volatile magnetic memory. One decisive parameter in this connection is the spin polarization, i.e., the degree of parallel orientation of the spins of the electrons that transport the charge. The ideal material will have the maximum possible spin polarization, i.e., the spins of the maximum number of current carrying electrons point in the same direction. The Mainz physicists have been able to produce the first experimental proof of almost complete spin polarization at room temperature in the metallic Heusler alloy Co2MnSi. "This class of materials has long been under investigation and there is substantial theoretical evidence for the required electronic properties of Heusler compounds but no single experiment has previously been able to confirm 100 percent spin polarization at room temperature," explained PD Dr. Martin Jourdan of JGU, the primary author of the study. Encouraging results had already been obtained at very low temperatures of -269 degree Celsius. Crucial for potential applications of the compound Co2MnSi, consisting of cobalt, manganese, and silicon, is an additional aspect of the experimental findings made by the scientists: They observed the high spin polarization at the material's surface. Professor Claudia Felser, who established the field of research into half-metallic Heusler materials 15 years ago, sees the results of the study as a long-awaited breakthrough. "Direct experimental evidence of 100 percent spin polarization has finally been found", said Felser, Director of the Max Planck Institute for Chemical Physics of Solids in Dresden. "This represents a major step forward when it comes to the development of new spintronic devices." The successful experiments were based on the preparation of samples with extreme precision. For this the crystalline structure of the Heusler compound had to be perfectly ordered, in particular at the material's surface, which was realized in Mainz by means of thin-film preparation in ultra-high vacuum. 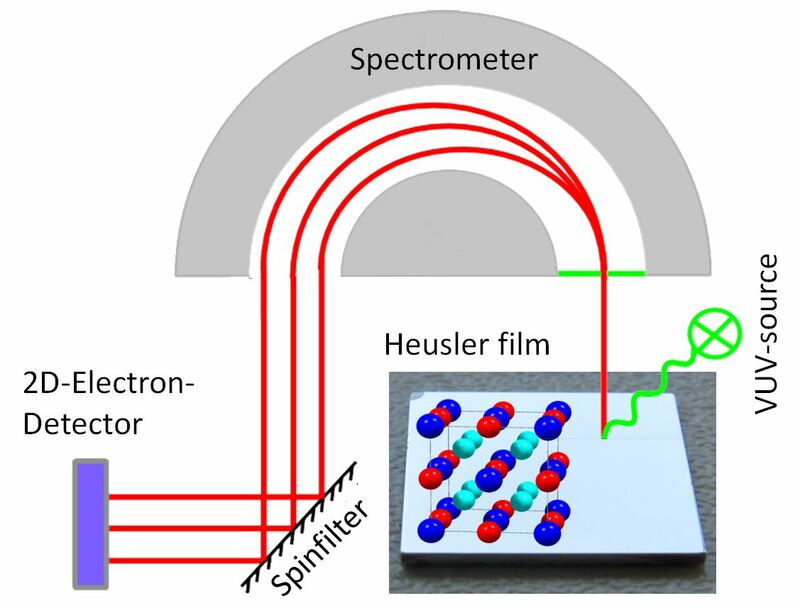 The spin polarization was then measured using photo electron spectroscopy and could be explained in collaboration with the theoreticians at LMU and the MPI-CPfS as the result of a special combination of bulk and surface properties of the compound. "It is not merely a breakthrough in the search for new spintronic materials but also in the interplay between theory and experiment," remarked Jourdan. "We were able to show that perfectly prepared materials actually have the properties that have been theoretically predicted." Heusler materials are being researched globally, particularly in Japan, Germany, and the USA. At JGU they are the subject of a core research unit that is part of the Graduate School of Excellence "Materials Science in Mainz" (MAINZ) and the Center for Innovative and Emerging Materials (CINEMA). The LMU physicochemists PD Dr. Jan Minar, Professor Jürgen Braun, and Professor Hubert Ebert provided the theoretical framework for this study. "The spectroscopic calculations were carried out using a so-called one-step model," explained Minar, a member of Ebert's team that developed the theoretical program. "Such a combination of electronic structure and theoretical photoemission calculations made direct comparison with the corresponding experimental data possible, which in turn was essential to interpreting the 100 percent spin polarization that was measured."